So, on to the stories! The first 2 are about our cover couple here. Her name is UMISE Nana, and she is a 17 year-old high school 3rd-year (senior). She seems like an average cute girl, but something is troubling her. Here she is, in her last year of high school, and she has never had a boyfriend! Granted, she wasn’t actively pursuing one before, and hasn’t fallen for anyone, but now it feels like a glaring absence from her life. She wonders if she will ever be able to fall for anyone. Obviously she will, or this story would be pretty short. One day, while on her way home from hanging out with her friends and listening to them talk about their boyfriends. Nana decides to stop at the nearby beach and do some thinking. She is so lost in her thoughts, staring out at the ocean, that she doesn’t realize her book bag is unzipped, and the beach breeze is sending her schoolwork papers flying all over the place. ACK! Fortunately, someone is there to help her pick them up. And OMG, it’s a cute guy! He helpfully hands Nana her papers back, and she tries not to act too flustered, because wow, he is really cute. Could she have found true love at last? Nana manages to find the courage to get his cell phone number, and is happily thinking about him later when the unexpected happens. The boy shows up at her house! Hey, wait a minute, how did he know where she lives? Just who is he? Oh man, how embarrassing! Turns out Nana should have recognized her handsome dreamboat. After all, he has been to her house several times! In fact, he is one of her younger brother’s close friends! This means he is younger than Nana. 5 years younger! Oh boy, talk about a gap! That would put him at 12 or 13 years old. Well, he certainly looks mature for his age. However, that age gap is just too much for Nana. She couldn’t possibly really be interested in someone so much younger, could she? And what about him? He helped her pick up papers, but that doesn’t mean he likes her or anything… what does teh future hold for this odd pairing? The third chapter in this volume gives us a new couple to cheer for. 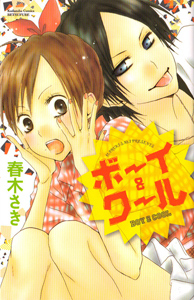 Yuriya is a high school girl who has a secret crush on her male best friend, Tsukasa. Yuriya has a tsundere type of personality, so even though she has a crush on him, she tends to react to her own uncomfortable feelings by yelling at him and calling him names. He doesn’t mind though; he jokes right back at her. They are loudmouthed casual friends. Therefore, even though she is always grumpy and mean towards Tsukasa, she is secretly dismayed when it comes time for her class to change their seating order and her desk ends up far away from Tsukasa’s desk. Even worse, he is now sitting next to the gentle and pretty Nakahodo-san. Yuriya has difficulty expressing her real feelings to Tsukasa, and finds herself in an awful situation when he tells her that he thinks he has fallen for Nakahodo-san! Oh no! What will Yuriya do? Nakahodo is so nice and pretty and has totally captivated Tsukasa. Will he ever be able to see how much Yuriya cares about him? It’s a shame this is a one-shot volume because I wouldn’t mind seeing more of any of the three couples featured in this!